Are you looking for healthy eats in Toronto? H2 Kitchen on Queen street recently opened with an extensive menu of nutritious hot and cold dishes. They aim to inspire people to eat healthier with international dishes that both taste good and feel good to eat. I stopped by for lunch this past weekend and I already want to go back. Their menu consists of poke bowls, salad & grain bowls, hot noodle soups, healthy toasts, smoothie bowls and more! Their signature Hokkaido Dive poke bowl comes with uni, tuna and caviar, but unfortunately they only make 20 orders a day and they were had just sold out for the day when I was there. For the poke bowls, you can choose sushi rice, brown rice, soba or yam noodles as a base and they don’t use any mayonnaise based sauces. We tried the Salmon x Tako Poke, a bowl of sushi rice covered in ponzu salmon, octopus, cucumber, red onions, cherry tomato, corn, edamame, carrots, golden beets, red beets, crab meat, wakame salad and topped off with caviar and a baby scallop. The toppings were well balanced- fresh veggie toppings like shredded golden beats paired nicely with the richness of marinated raw salmon. We also ordered a Dancing Bombay bowl from their Salad & Grain Bowls selection. This bowl showed off the diversity of international flavours from their kitchen. It comes with grilled tandoori chicken on a bed of brown rice and is packed with nutritious veggies including baby spinach, corn, carrot, red onion, golden beets, cucumber, cherry tomatoes. They also throw in some pineapple and a mix of mango date dressing and sriracha maple dressing. For those looking for keto-friendly options, the H2 Crack Slaw is a winner. This was basically a big bowl of the fillings from a spring roll and is also known as an “egg roll in a bowl without the shell.” The H2 Crack Slaw is a mix of stir-fried cabbage, carrot, celery, onion, green onion with the option of adding proteins like jerk chicken, tandoori chicken, baby scallop, roasted chicken or shrimp. It’s like a hot salad with crunchy textures in each bite. For about $8, it’s a convenient and healthy no carb option that fits well with certain diets. H2 Kitchen also serves some dressed up toasts, and their $5 Avocado toast is one of their most popular items. Like the rest of their menu, the toast section is filled with simple, clean ingredients. 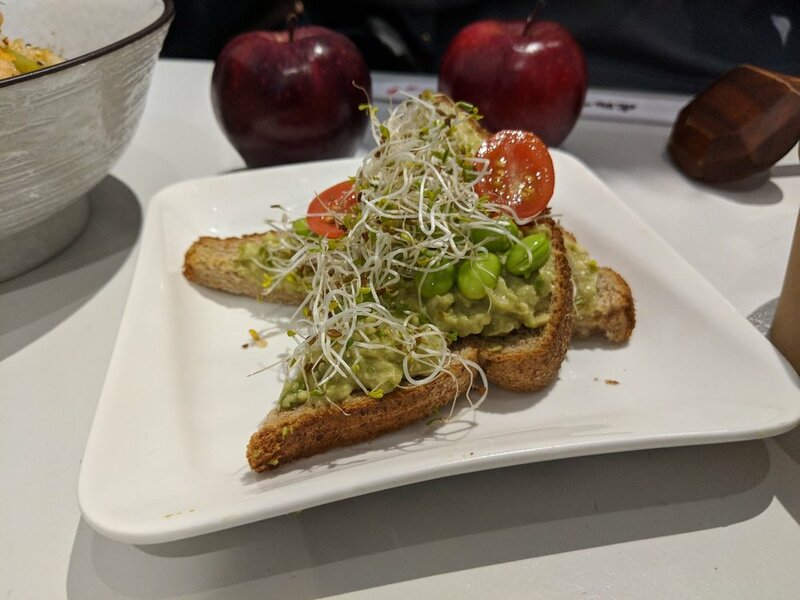 The Avocado toast was topped with mashed avocado, shelled edamame beans, alfalfa sprouts and makes for a quick breakfast or snack. If you’re feeling a bit hungrier, you may want to try their Thai Style Noodle Soup with Shrimp. A warm bowl of noodles with a flavourful soup made of green curry and coconut milk. With no heavy flavouring or msg, the soup was light and healthy, which complements all the veggies in the dish including bok choy, enoki mushrooms, red cabbage and some tofu too. Each meal also comes with an apple, another healthy touch. The restaurant’s space is bright and the vibe is casual. They have plugs at every table, making it a great spot to sit down to do work or study while enjoying a smoothie, coffee, tea or some of their healthy eats. Before I left, I also tried their Very Berry and Peach/Pineapple smoothies. All their smoothies are greek yogurt based and made with fresh fruit. I loved the addition of mint leaf to the Very Berry smoothie, and they also use ingredients like coconut water and turmeric powder for different smoothies. The Peach/Pineapple smoothie came with a lot of turmeric powder, which has lots of health benefits, but the taste may be a surprise if you’re not fond of the turmeric taste. H2 Kitchen is one of the best options for healthy eats downtown with prices that make sense. They have a well thought out menu that caters to a variety of tastes and dietary needs. Their space on Queen West is both comfortable and modern. 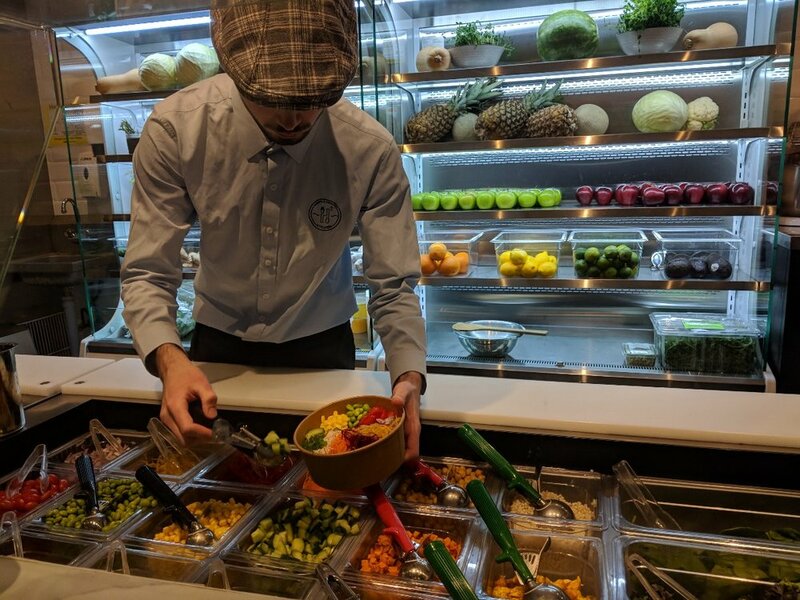 Behind their counter is a well lit fridge stocked with fresh vegetables and fruits and the wall is lined with quotes that inspire healthy living. They also offer a membership card ($5/ year) that gives you ~$1 off each menu item. I love the H2 Kitchen concept and appreciate that they are serving delicious foods you can eat without feeling bad about.